Holy Potatoes! We're in Space?! is an indie game developed by Daylight Studios, creators of Holy Potatoes! A Weapon Shop? !, that combines the elements of strategy, adventure, and rougelike games. The game protagonists are Casie and Fay. Holy Potatoes! We’re in Space?! for PC, PS4 and etc. 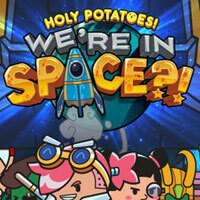 is an indie game developed by Daylight Studios, creators of the well-received Holy Potatoes! A Weapon Shop?!. The game is an interesting mix of rouglike, adventure, and strategy games. Holy Potatoes! focuses on Cassie and Fay and their adventures in space. Their goal is to find their missing grandfather Jiji, who was kidnapped by an evil Eclipse federation. During our adventures we will meet many NPCs, some more hostile than the others, who might be helpful in our mission. The game is filled with a peculiar sense of humour present all in the dialogues, world building, and the overall stylistics. In Holy Potatoes! We’re in Space?! for PC, PS4 and etc. we explore a procedurally generated universe, inhabited by various organic live forms. Space whales, living zucchinis, onions, the titular potates (who, by the way, are fantastic engineers); these are just a few of them. The game’s universe is full of different galaxies. We will visit various planets that can provide us with useful resources (like antimatter, plasma, biomass, or gun components). Those resurces are used in the crafting system, through which we upgrade our ship and construct new weapons, which then are used against increasingly powerful enemies. We will have to face various opponents in turn-based combats. Our tactics and equipment are the key to victory. We have rocket launchers, laser rifles, and prototype electromagnetic cannons at our disposal. Defeating a carrot spaceship or a galactic broccoli may not be that much of a challenge, but facing a powerful boss will definitely be more difficult. We will also have to manage our ship and our crew. The better specialist we hire, the more useful and powerful equipment can be installed on our ship. Holy Potatoes! We’re in Space?! For PC, PS4 and etc. has eye pleasing, comic-book inspired 2D visuals. The game’s OST also adds to the overall vibe of the grand space adventure.